Finite Element Analysis is one of the efficient methods to comprehensively evaluate engineering products for strength, reliability and useful life cycle. Most engineering devices developed today, make use of computational tools to perform finite element analysis before being physically tested. The use of computational technology enables engineers to modify, re-engineer or optimize design to suit specific applications without actually developing prototypes. Moreover, modern finite element tools are capable to even couple multiple physics such as structural-thermal, piezoelectric or acoustics, allowing engineers to extract meaningful information in the earlier design phase itself. The benefits of finite element tools lies in its ability to significantly reduce the turn around time needed to perform design evaluation and modifications compared to conventional physical testing. Design engineers can quickly measure the performance capabilities and impose geometrical changes, precisely at the regions under excessive stress concentrations. With the added advantage of material library, the task of comparing the behavior of product made up of different materials, becomes easier and more effective. 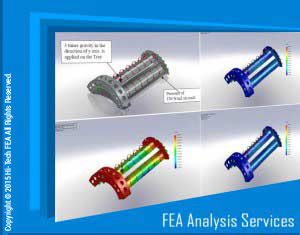 FEA is a useful tool for most manufacturers today in terms of increasing the productivity, as it assists in developing designs rapidly. However, the most promising feature of this tool is to allow designers to downsize the product geometry while maintaining the strength, proving effective in reducing the material consumption. It is extensively used to improve the quality of the design by simulating conditions that replicate real world conditions. With the ability to predict the product’s useful life cycle, considering the effects of static as well dynamic forces and varied physics, FEA drastically improves an engineer’s vision to develop quality products. The ability to comprehensively evaluate the product before actual production is what makes finite element analysis as a viable choice for manufacturers across the globe. The addition of this dimension in design evaluation has only befitted the engineers to devise out innovative, efficient and optimized engineering products that not only increases industrial productivity, but also complements the market competition.